The week started off badly on Monday, with the truck losing its brakes on the way home from work. Mid-American Sprint Series races seem to bring the worst out in our truck. Thankfully, I noticed fairly quickly that they were soft and getting softer. I was able to slowly and carefully drive the truck to C&M Auto Service for repair. The prognosis was good in that it was fixable but all of the brake lines and hoses needed to be replaced. It was going to take a long time, but thanks to some hard work and long hours from the guys at C&M, the truck was ready for us about 8am on Friday morning. Wen loaded up about 14 hours later than originally planned and were off to Concept Haulers Motor Speedway (CHMS) for some test and tune. CHMS is our home track. It was the first track Jason raced his own kart. Last year he took second place in the local “pro” series. 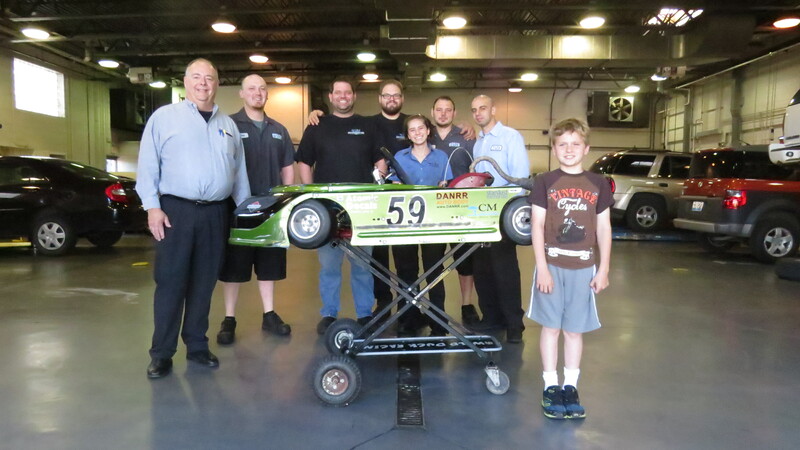 Despite all of that time on the track we actually needed to work very hard to get him and the kart to place where he could be competitive with more experienced teams. It was a simple plan: make a change and see if he goes faster. Right off the bat, he was faster then he had ever been last year, running low 49s, compared to last years fastest time of 61 seconds. Some of the speed comes from the slightly shorter green slide, but most of it is him just racing more. He has already had 12 race days plus 5 solid days of “sight reading” new tracks. We have not really had any time for just plain old practice and making those fine adjustments. This is when we did it. But the day was well spent. We found a setup that should keep us near the front starting, in the low 48’s high 47’s. I expected the fast kids to hit 46 at some point. Saturday was the true test, did we get it right? Has he found the “go fast”. CHMS is a speed track with a couple of long straights with just a few tight corners. Nowhere near as difficult as Badger or even Mid-State. There were going to be 5 drivers for the day: Ashton (7), Seth (88), Dylan (4), Nick (23) and Jason (59). Jason has seen all these drivers and I expected it to be pretty close. He qualified 4 of 5, which was about right. The pre-feature (10 laps) brought a second place finish due to spins in turns 2 and the hairpin, and some smart clean driving. The feature (16 laps) was pretty good. He started second and stayed there. Ashton tried to make a pass on the inside of the monza but was late to the corner and got pinched off the track when Jason held his line and kept going to the end. While he was off the pace there was some great driving and he raced clean. Unfortunately, I made a huge mistake in the carburetor setup and he was disqualified – too much movement in the slide. It would have been a great finish to the day but it only ended in disappointment. The second worst part of the day was finding out. The worst part was telling him. Time for a reset: check the carb and then check it again, check the gearing, nuts bolts, tire pressure, fill the tank, check the tank bolt (again). Jason is at the point in his driving where little things make a difference in his lap time. Just a pound of tire pressure can make a half second difference in his times, just like the pros. Sunday’s class only had 4 drivers, since Dylan did not return. Jason qualified 3rd and was only 2 hundredths of a second behind Seth. The pre-feature was a tough, close race. He started third and really kept up with Seth and Ashton. Ashton lost his grip in turn 3 and went over the edge in to the grass, ending his race. Jason persisted and kept up with Seth finishing only few tenths of a second behind. This put him in the second spot for the feature. On the green he pressed hard on the peddle and charged the outside of turn one and took the lead and stayed there lap after lap as Seth tried to find the space to get by. As the race ran down Seth pushed harder and eventually made the pass in the front straight on the 13th lap. Jason held second for another lap until Ashton caught and passed him. Jason was super excited to finish this race in 3rd. Sunday Pre-Feature, no camera for the feature, grumbleOver the next few weeks we are going to tear the kart apart and do some much needed repairs on the body. 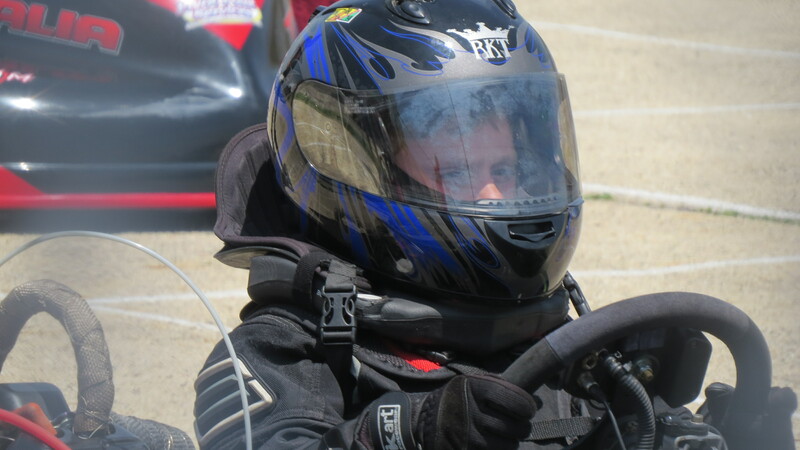 While we work on that Jason is interested in trying some oval racing so we are going to head to Belvidere, IL and Durand, IL for some street oval racing. He has been bugging me all summer to do this. This week we are extremely grateful to the guys at C&M Auto Service for putting the extra effort in to get us back on the road in time for this weekend’s race. To the guys we race with for letting us have so much fun. Karen and Katie, thanks for taking time out this weekend and cheering him on.